Motor sports didn’t have the greatest beginning in India. Mainly because it took forever for motor cars to make more than just an appearance in the country. In a time when only the wealthy Maharajas owned automobiles, the Motor Union of Western India decided it was time to show Indians that their roads were now ready for cars. And thereby was born the first motor sporting event of the nation. The race was to be from Delhi to Mumbai, and the car that reached the finish line in the best condition, would be deemed the winner. When it started out, motor sports was something you did just for the thrill of it. Driving down Worli Seaface in Mumbai or puffing around in an old Ford on Marina Road in Chennai. There were no rules, no central governing body administering the sport, no national competitions and prize money, and definitely no professionals. While World War II put a stop to whatever little racing the country had up its belt, motor sports enthusiasts weren’t done. After the war, a series of clubs sprung up around the country – creating more havoc than harmony. Rules weren’t standard, regulations didn’t exist, and soon the clubs lost access to their racetracks. Although South India has always been considered the cradle of motor sports in the country, there wasn’t much happening even there. People raced for fun. Not for glory or prize money. Participants were in fact requested to “contribute” towards the race expenses. Clearly motor sports suffered from lack of financial aid. And in 1969, all that began to change. 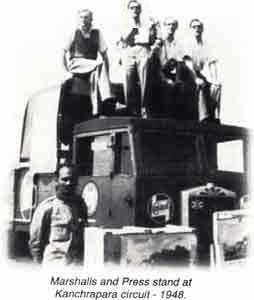 In 1970, the Western India Automobile Association (WIAA) at Mumbai conducted the 7000 km long All India Highway Motor Rally based on the Monte Carlo Rally. It was to be completed in a week’s time and formed part of the silver jubilee celebrations of India’s independence. It was sanctioned by the Federation International Automobile (FIA) and backed by all motor sport clubs in India. The rally attracted 120 entries and the competition started simultaneously from Chennai, Kolkata, Delhi and Mumbai. They were all Nagpur-bound. This was the first time big prize money was offered. After this rally, a group of Mumbai riders went to Chennai to participate in a race and were aghast at the lack of rules. It was only after they complained, that in 1971, the Madras Motor Sports Club, Bangalore Motorsports Club later named as Karnataka Motor Sports Club, the Calcutta Motor Sports Club, the Coimbatore Auto Sports Club and the Indian Automotive Racing Club, became the founder members of the Federation of Motor Sports Club of India (FMSCI), India’s first national governing body for auto racing and rallying in the country. The Federation was registered as a Private Limited Non-Profit Company in 1973, became affiliated to Federation Internationale de l’Automobile in 1979 and to the Federation Internationale de Motocyclisme in 1986. Fifteen years after its inception, the FMSCI was recognised by the Government of India as the sole authority to control and conduct motor sport events in India. Taking inspiration from the already existing international rules of motor sport, the Federation’s constitution and a whole set of technical regulations that was to govern the sport were framed. And once this was done, there was no looking back. In 1980, motor sport in India went truly international with the Himalayan Rally. Unfortunately, though, this rally faced a lot of issues and quietly faded into oblivion after a few years, in spite of being quite successful. The 90s saw the growth of the National Rally Championship with Castrol as the Title sponsor. The National Racing Championship took roots with support from JK Tyres. Now with FMSCI firmly in the saddle as the ASN of the FIA and the FMN of the FIM, it can look forward to growth and stability across India.